Biotinylated Human TIM-3, His Tag (TM3-H82E7) is expressed from human 293 cells (HEK293). It contains AA Ser 22 - Arg 200 (Accession # Q8TDQ0-1). The protein has a calculated MW of 23.1 kDa. The protein migrates as 40-50 kDa under reducing (R) condition (SDS-PAGE) due to glycosylation. 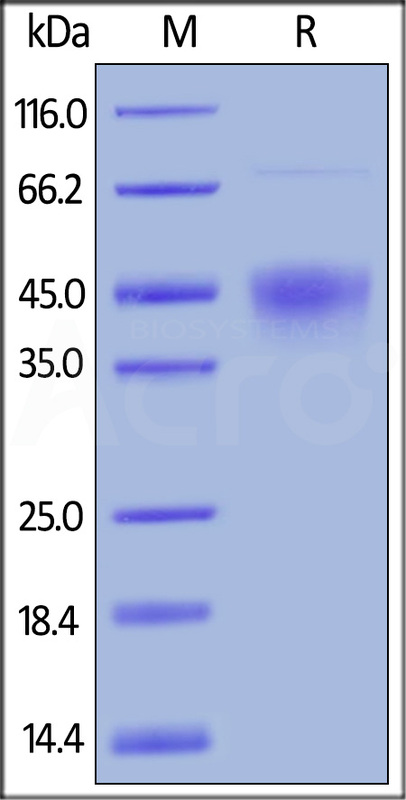 Biotinylated Human TIM-3, His Tag on SDS-PAGE under reducing (R) condition. The gel was stained overnight with Coomassie Blue. The purity of the protein is greater than 90%. 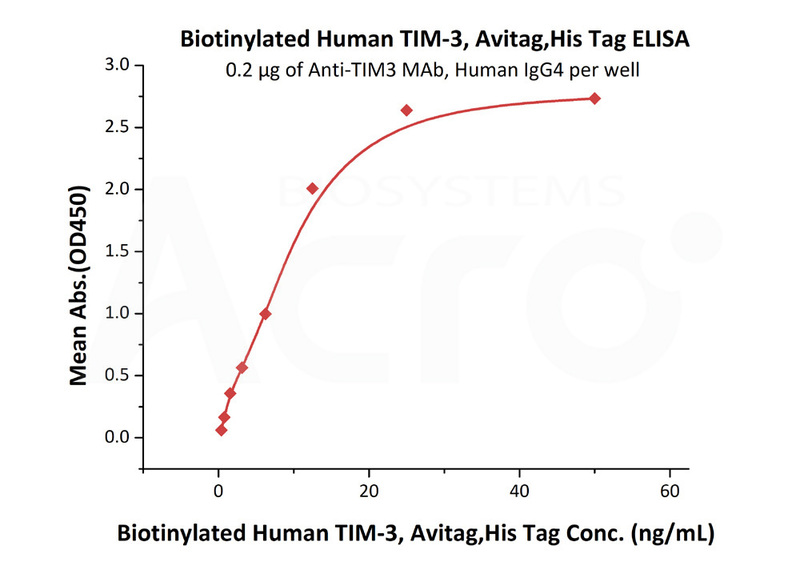 Immobilized Anti-TIM3 MAb, Human IgG4 at 2 μg/mL (100 μL/well) can bind Biotinylated Human TIM-3, His Tag (Cat. No. TM3-H82E7) with a linear range of 0.4-13 ng/mL (QC tested). Hepatitis A virus cellular receptor 2 is also known as HAVCR2, FLJ14428, KIM3, TIM3, TIMD3, is a member of the TIM family of immune regulating molecules with one Ig-like V-type domain and a Ser/Thr-rich mucin stalk. CD4-positive T helper lymphocytes can be divided into types 1 (Th1) and 2 (Th2) on the basis of their cytokine secretion patterns. Th1 cells and their associated cytokines are involved in cell-mediated immunity to intracellular pathogens and delayed-type hypersensitivity reactions, whereas Th2 cells are involved in the control of extracellular helminthic infections and the promotion of atopic and allergic diseases. The 2 types of cells also cross-regulate the functions of the other. HAVCR2 is a Th1-specific cell surface protein that regulates macrophage activation and enhances the severity of experimental autoimmune encephalomyelitis in mice. HAVCR2 regulates macrophage activation. Inhibits T-helper type 1 lymphocyte (Th1)-mediated auto- and alloimmune responses and promotes immunological tolerance. May be also involved in T-cell homing. Dysregulation of the HAVCR2-galectin-9 pathway could underlie chronic autoimmune disease states in human, such as multiple sclerosis. (1) Monney, L. et al., 2002, Nature. 415: 536-41. (2) Sabatos, CA. et al., 2003, Nat. Immunol. 4: 1102-10. (3) Anderson, AC. et al., 2006, Curr. Opin. Immunol. 18: 665-9.